On rusty-red Mars, a curious deposit of gray-colored hematite (a mineral cousin of common household rust) could hold the key to the mystery of elusive Martian water. March 28, 2001 -- What makes the Red Planet red? Scientists think Mars has a bad case of rust. Martian soil is full of iron-bearing compounds that, over the eons, have reacted with trace amounts of oxygen and water vapor in Mars' atmosphere to form iron oxide -- the same chemical that covers innumerable rusty nails in garages and workshops on Earth. Above: A panoramic view of Mars from the Sagan Memorial Station where Pathfinder landed in 1997. The word "rust" conjures up images of things that are red --like Mars and old nails-- but not all iron oxide is the same color. Here on Earth a gray-hued variety of iron oxide, a mineral called hematite, can precipitate in hot springs or in standing pools of water. Gray hematite is not the sort of rust you might expect to find on a desert-dry planet like Mars. But perhaps Mars wasn't always as dry as it is today. There are many signs of ancient or hidden water on the Red Planet including flash-flood gullies, sedimentary layers ... and hematite. In 1998, an infrared spectrometer on NASA's Mars Global Surveyor (MGS) spacecraft detected a substantial deposit of gray hematite near the Martian equator, in a 500 km-wide region called Sinus Meridiani. The discovery raised the tantalizing possibility that hot springs were once active on Mars. Right: An artist's concept of ancient hot springs on Mars where gray hematite might have collected. "We believe that the gray hematite is very strong evidence that water was once present in that area," said Victoria Hamilton, a planetary geologist at Arizona State University (ASU). "We think the deposit is fairly old. It was buried, perhaps, for several hundred million years or more and now it's being exposed by wind erosion." Gray hematite has the same chemical formula (Fe2O3) as its rusty-red cousin, but a different crystalline structure. Red rust is fine and powdery; typical grains are hundreds of nanometers to a few microns across. Gray hematite crystals are larger, like grains of sand. "Red and gray iron oxides on Mars are really just different forms of the same mineral," explained Hamilton. "If you ground up the gray hematite into a fine powder it would turn red because the smaller grains scatter red light." The coarse-grained structure of gray hematite is important, says ASU's Jack Farmer, head of the NASA Astrobiology Institute's Mars Focus Group, because "to get that kind of coarsening of the crystallinity, you would need to have a reasonable amount of water available" where the hematite formed. The link between water and gray hematite makes the so-called "Hematite Site" (Sinus Meridiani) an alluring target for future Mars landers as well as for remote sensing instruments on the 2001 Mars Odyssey spacecraft -- slated to launch on April 7th. Left: The distribution of hematite in Sinus Meridiani. This image, courtesy of Phil Christensen, is reprinted from "Global mapping of Martian hematite mineral deposits: Remnants of water-driven processes on early Mars", by P.R. Christensen et al., Journal of Geophysical Research, in press. Odyssey will carry an infrared imaging camera called THEMIS (short for Thermal Emission Imaging System) that can identify surface minerals from orbit by analyzing their spectral "fingerprints." "It turns out that all materials vibrate at the atomic scale," explains Hamilton. "For minerals, the rate at which the atoms vibrate corresponds to the thermal infrared part of the electromagnetic spectrum, between about 5 and 50 microns. Those are longer wavelengths than what our eyes can see." Every mineral has a unique infrared spectrum that identifies it as surely as the fingerprints of a human being, she added. THEMIS is a "next-generation" instrument that can capture sharper images than TES, the Thermal Emission Spectrometer that is orbiting Mars now aboard Mars Global Surveyor. THEMIS will be able to discern the mineral content of geological features only 100 meters across, compared to 3 km for TES. Above: The spectral "fingerprint" of hematite. The peaks and valleys of this graph are characteristic of infrared emissions from hematite. Courtesy of the Arizona State University Thermal Emission Spectral Library. 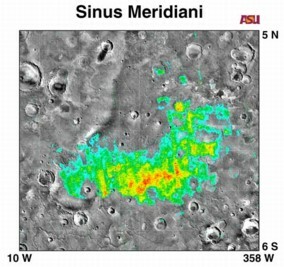 Of many candidate landing sites for NASA's 2003 Mars Exploration Rovers, the Sinus Meridiani region is one of the most intriguing to scientists. THEMIS data could help planners pinpoint the best places to land, especially if the maps reveal deposits of other aqueous minerals such as carbonates or sulfates. "The interesting thing about carbonates and sulfates," says Phil Christensen, principal investigator for THEMIS, "is that these materials can be better (than hematite) at preserving a fossil record. Some of them, like carbonates, would also indicate that standing bodies of water were present on the surface." Hematite minerals, on the other hand, might have been formed by hydrothermal water deep underground. So far, instruments on MGS have found no direct evidence for carbonates or sulfates anywhere on Mars. The absence of such aqueous minerals is a mystery if liquid Martian water -- in the form of lakes, rivers or oceans -- was indeed abundant in the planet's geological past. Christensen cautions that the spatial resolution of TES on Mars Global Surveyor might not have been good enough to detect small deposits of carbonates. With its superior resolution, THEMIS has a better chance. For example, TES would not have detected the carbonate layers in Earth's Grand Canyon, but THEMIS would. Until someone finds signs of carbonates or sulfates on Mars, perhaps in some future THEMIS image, gray hematite remains the best known mineral signpost for ancient Martian water. The hematite makes scientists wonder, was there once a Martian equivalent of Yellowstone National Park where steaming hot springs formed hematite-laden pools? And are underground springs still present there today? Human exploration of the Red Planet could hinge on the answers. And there may be no better place to find out than Sinus Meridiani, where the lure of hematite is powerful indeed. Editor's Note: Why is iron so common on the surface of Mars? On Earth the vast majority of our planet's iron sank to the core while our world was still young and molten. Mars is a smaller planet than Earth and it is less well differentiated. The iron core of Mars is smaller and there is more iron left in that planet's upper layers. Carbonated Mars -- Science@NASA article: Here on Earth the only way to make carbonate rocks is with the aid of liquid water. Finding such rocks on Mars might prove, once and for all, that the barren Red Planet was once warm and wet. The Science and Technology Directorate at NASA's Marshall Space Flight Center sponsors the Science@NASA web sites. The mission of Science@NASA is to help the public understand how exciting NASA research is and to help NASA scientists fulfill their outreach responsibilities.